The U.S. economy continues to exhibit resilience despite numerous headwinds that have threatened to derail the economic recovery. Although the “fiscal cliff,” the largest threat to the economy, still looms, and lawmakers in Washington, D.C., have shown little progress in reaching a deal to avert the tax increases and spending cuts that could send the economy back into a recession, both sides recognize the severity of the situation. Still, there is potential that political gridlock could result in a significant hit to GDP. The anticipated compromise will include tax hikes for the highest income households as well as spending cuts, but these will weigh on the economy less than the uncertainty currently being faced by businesses. If a bargain is reached, the U.S. is positioned to add 2.5 million jobs in 2013. In November, employers added 146,000 jobs, eclipsing expectations that “fiscal cliff” uncertainty and Hurricane Sandy would significantly weaken employment growth. The private sector added 147,000 jobs last month, while the government eliminated 1,000 positions. The preliminary figures for September and October were revised down by 49,000 jobs, mostly in the government sector. Rather than actual job cuts, the revisions likely reflect challenges with seasonal adjustments. The early Thanksgiving weekend and the Black Friday kickoff to holiday shopping powered retail sector hiring in November, with the addition of 53,000 jobs. The construction sector, meanwhile, posted the most significant drop due to projects put on hold from Hurricane Sandy. The 20,000 positions lost during November are expected to be recaptured in December, along with thousands more as rebuilding efforts in the Northeast gain momentum. The unemployment rate dropped 20 basis points to 7.7 percent, the lowest level in almost four years. The decline is primarily attributed to a reduction in the labor force participation rate, which also fell 20 basis points to 63.6 percent. The decrease was a combination of Hurricane Sandy, as some job seekers delayed searching for work during the storm and aftermath, together with some deciding to wait out the Holidays before renewing their search for work. 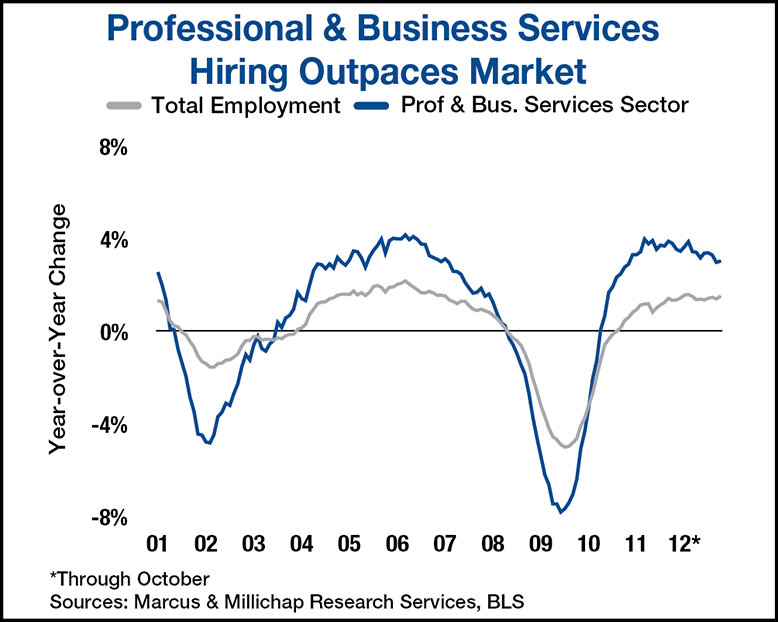 The professional and business services sector added 43,000 jobs during November, just 1,000 positions short of becoming the fourth sector to surpass pre-recession levels. The natural resources and mining, leisure and hospitality, and education and health services sectors are already at all-time highs. As these office-using jobs help backfill empty cubicles, measurable improvement in the office vacancy rate will begin to occur. By year-end 2012, office vacancy will dip to 17 percent and retreat into the low-16 percent range during 2013. Retail employers staffed for the holidays early this year due to the early arrival of Thanksgiving and longer hours scheduled by many stores. Based on the preliminary data, retail sales for the holiday season will be the highest since 2007 on a per-person basis, which will bode well for local retailers. Combined with a dearth of new construction, strong retail demand will push the vacancy rate down to 9.4 percent by year and into the mid-8 percent range in 2013. This entry was written by marcusmillichap, posted on December 10, 2012 at 7:16 pm, filed under Research and tagged Commercial Real Estate, Jobs. Bookmark the permalink. Follow any comments here with the RSS feed for this post. Trackbacks are closed, but you can post a comment. satisfied to convey that I’ve an incredibly good uncanny feeling I discovered just what I needed. I so much indisputably will make sure to do not overlook this website and provides it a glance on a continuing basis. I’ll certainly digg it and personally suggest to my friends. I’m sure they’ll be benefited from this site.